Luke Schoenfelder was an avid builder of childhood forts. Now, the 21-year-old Georgetown University student has created what he calls the "ultimate fort." Made of polypropylene bags stuffed with earth, the circular hut set well back in his family's Willow Street area woodlot surely could hold enemy scouts at bay. But Schoenfelder created the structure to show how well it can deflect rain, snow, cold and excess heat at little cost to its inhabitants or the environment. It's designed to help save the world . Down the road, Shoenfelder said, he and a friend, Sam Gibson, might start a business to market the energy-efficient structures as sustainable housing. Shorter term, he intends to export the concept to Third World communities in dire need of cheap, sturdy housing that doesn't gobble resources to put up or maintain. Rafiki Africa Foundation co-director Roger Godfrey is excited about introducing earthbag houses to Alendu, the rural western Kenya village where his wife, Dorothy Dulo, comes from. He and Schoenfelder are planning an exploratory trip there later this year, when Schoenfelder is on school break. A longtime friend of Schoenfelder and his family, and a standholder at Lancaster's Central Market, Godfrey is a native Ugandan who has worked for years to help African victims of disease and poverty. Godfrey noted that previous projects to build brick houses in the village proved to be too expensive. Bags, though, are commonly used to ship relief supplies and are readily available. When he heard about earthbag housing from Schoenfelder, Godfrey added, he sensed huge potential. "I knew it was something that could really help a lot of people." Schoenfelder said alternative shelters caught his interest after his aunt and uncle in New Mexico built a rammed earth house (whose walls are made of earth packed between outer and inner shells). 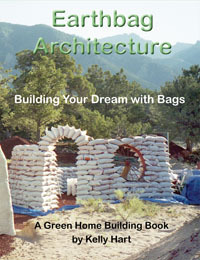 Armed with a copy of the book, "Earth Bag Buildings, the Tools, Tricks and Techniques," he set out in the last week of July 2009 to erect a prototype. Friends and family assisted him in digging a pit about 4 feet deep and laying a thinly graveled floor girdled by plastic drainage pipe. And then Schoenfelder started filling 650 kidney bean bags that he was able to buy for 11 cents each because they had misprinted labels. Gibson helped shovel. The two men tied the bags shut with twine. "It was definitely hot and sweaty in the woods but it was a lot of fun," said Gibson, a 21-year-old Ephrata resident majoring in civil engineering at the University of Pittsburgh. Schoenfelder said his friend's "awesome favor" helped him speed the project to completion. But not without a bit of a hitch. Schoenfelder, who attended Millersville University before transferring to Georgetown, was a week shy of starting the fall semester when his building collapsed. He hadn't tamped down the earth in the bags enough, he explained, and he'd made the wood-framed door opening too narrow. Redoubling his efforts, he restacked the rows and added a roof of clear plastic sheeting supported by three locust poles gleaned from the nearby woods. He finished in under 200 hours, a day ahead of schedule. On a recent chilly morning, he donned black rubber boots and slogged through sopping meadows to the hut site. The 7-foot-high building stood hemmed by mayapples and arching trees. The foot-thick walls, situated partially below the frost line and held in place by unseen strands of barbed wire, provide excellent insulation from the heat and cold. The 10 1/2-foot diameter structure easily shrugged off this winter's heavy snows, according to Schoenfelder. Nor was it a drain on the earth's - or his wallet's - resources. Costing slightly more than $200, the project kicked out none of the 8.7 pounds per square foot of waste that Schoenfelder said building the average new home generates. The hut, which could accommodate a family of four African villagers, would take but a small amount of energy to cool and heat, Schoenfelder said. He's contemplating adding a wood stove. "Every generation feels like it has to live in a bigger and bigger house," he added. Homes become less and less affordable. These economic and environmental trends can't be maintained. "Only through new and innovative means can we prevent the inevitable collapse of our way of life," Schoenfelder wrote in a project summary. Building houses out of mud is, of course, an ancient innovation. In recent decades, "Garbage Warrior" architect Mike Reynolds has created self-sufficient "Earthship" dwellings insulated with soil. The late Iranian-born architect, humanitarian and NASA designer Nader Khalili is said to have hatched the earthbag idea - he called it "superadobe" - in the 1980s. Existing earthbag buildings have walls sandwiched between protective finishing layers so they're indistinguishable from conventional houses. They can be constructed to large scales and fitted for electricity and plumbing, as Internet photos of the projects show. Many of those pictures were taken in the Western United States. "As far as I know," Schoenfelder said, "no one around here is building them." Zoning is an unknown, said Schoenfelder, who figures the law degree he plans to get will help him deal with that potential hurdle. He hopes to one day live among bags filled with earth. "I can't wait to build a full-scale house like this," he said. "It really is super simple and that is the big advantage to it."